Published In: G.E.Clarke (ed. ): Development, Society and Environment in Tibet, Proc. 7th Sem. Intern. Assoc. Tibetan Studies (IATS) 1995 - Austria, Vienna (1998), p.79-96. This paper focuses on two of the most striking phenomena of the forests in eastern Tibet: the existence of forest-free south-facing slopes and modern-day deforestation. Under the first heading it examines the cumulative historical impact both of fire, and of people and their grazing animals on forest distribution; under the second, it discusses the extent, causes, and possible solutions to the critical problem of modern deforestation. Over the last 15 years western research largely has overlooked eastern Tibet both directly, and indirectly as Chinese materials have presented a language barrier. This paper is based on observations of the forests of the south-eastern Tibetan plateau which were made during a six week field study carried out by the author of the forest vegetation of Zitsa Degu (gZi rTsa sDe dGu; Chin. Jiuzhaigou) Nature Reserve (Winkler 1994,1997,1998), north-east of Aba (rNga Ba) in Aba Tibetan Autonomous Prefecture, north-west Sichuan / south-east Amdo ('A mDo) (Maps 2 & 4). It utilises available western language sources and Chinese articles on the forests of the area as secondary source material, and these form the basis for the quantitative account of deforestation. An area as vast and inaccessible as the Tibetan Plateau calls for the application of remote sensing technologies. Yet applying remote sensing techniques in high mountain areas with a rugged terrain faces many technical difficulties, especially relief-induced distortions. To try to use digital remote sensing data to evaluate forest cover predominantly spread on north facing slopes, creates even more difficulties due to the lack of data reflection on shady slopes. Since the late 1970's there have been attempts in China to use Landsat MSS (Multi Spectral Scanner) data to perform forest inventories (Fang 1980). The TAR's most recent forest statistics are based on data derived from remote sensing technology (Xinhua 1994). De Wulf et al (1988, 1990) used Landsat MSS-data to map out bamboo forests as possible Giant Panda habitat in west Sichuan. Woodrow (1990) produced a small-scale map based on NOAA-data (National Oceanic and Atmospheric Administration) on the major environmental units of the Tibetan Plateau. So far there is no published comprehensive report on the extent of deforestation based on satellite data. Fix-Kirst (1994) tried to map clear-cut areas around Nyingchi (Nying Khri), yet without achieving the objective. A similar attempt has been made by Andersen and Hansen (1994) south of Derge (sDe dGe). Leber et al (1995) used multisensoral and multitemporal remote sensing data, including Metric Camera, Landsat MSS and TM (Thematic Mapper), Spot PAN (Panchromatic Imagery) and ERS-1 (Earth Resources Satellite One) synthetic aperture radar (SAR) to evaluate environmental changes in the wider Shigatse area, an area presently free of forest. free of forests. To the left fresh clear-felling  has destroyed this pattern. The north-facing slopes are recognisable by their whiter snow cover; the south-facing slopes were only covered the day before by a snow storm. 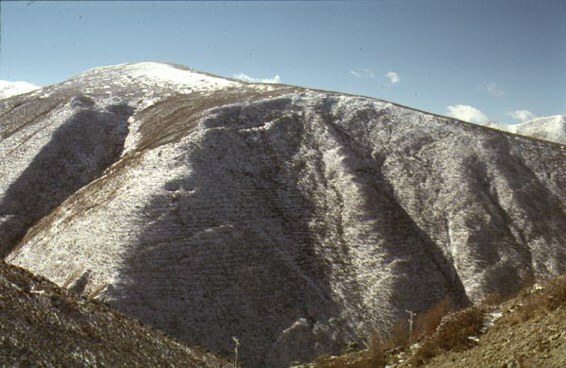 An examination of the distribution of vegetation across the overall area gives one a good idea of climatic conditions on the Tibetan plateau. Due to the increasingly continental climatic conditions, there is a steady decrease in average temperature and annual rainfall as one rises from the south-east (rainfall above 1,500mm per annum) to the north-west (rainfall below 100mm per annum); this is matched by a corresponding decrease in biomass and biodiversity. While the south-east has lush dense forests with conifers of over 60 metres in height, especially along the deeply dissected fringes off the Tibetan plateau, in the north-west the less mountainous northern plateau or Changthang (Byang Thang) is characterised by extremely sparse, high-altitude desert vegetation. In between these two extremes exists a whole range of vegetation zones: as one ascends, the spruce-fir forests become sparser and less rich in species, before giving way to open juniper forest; gradually these too are replaced by scrub and grassland, before finally giving way to scanty desert vegetation. In addition to the rainfall or precipitation gradient, there is also a land heat-source factor, which raises the altitudinal zones of vegetation along with the rise in the general land-surface of the plateau itself. Hence, while on the fringes of the plateau forests grow up to `only' 3,600 metres, on the plateau itself forests manage to persist at 4,700 metres. 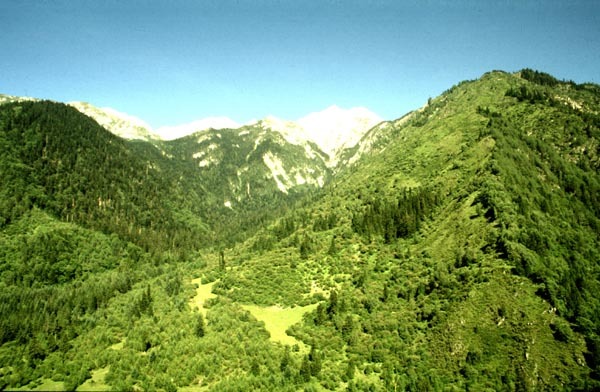 The highest true treeline in the world is probably in this area and around the altitude of 4,700 metres, such as the forests around Dzog Chen (rDzogs Chen) Monastery in Der Ge (sDe dGe) (Schäfer 1938: 41) and adjoining western areas up to Nyingchi (Nying Khri). Large forested areas are found in the south-east of the Tibetan Autonomous Region (TAR), in west Sichuan, and in north-west Yunnan; there are also forests in south-west Gansu and scattered patches in Qinghai. The forests follow the river valleys up on to the plateau where they become less luxuriant due to harsher climatic conditions. Most forests are to be found on north-facing slopes, while the south-facing slopes are grassland. For example, this is easily observed while driving north along the headwaters of the Min River (Zong Chu) north of (Chin.) Songpan (Zhung Phen). Except for rare patches, the mountains appear free of forests. Travelling south along the same stretch and looking at the north-facing slopes ahead, for the main part the mountains are clad with dark coniferous forests. A photograph taken nearby at the Konke (Kun dGa' Ri) Pass (Plate 6.2) illustrates the south-facing slopes free of forest  and some still forest-clad north-facing slopes . The former clear-felled areas  have become scrubland; in the foreground  there is a nomad camp on pasture at the foot of the sunny south-facing slope. Modern clear-felling on north-facing slopes to one side, the general south/north pattern of forest distribution described above has been observed in the past by many explorers and scientists. Until the present-day it was believed that the sunny slopes were bare as their climatic conditions were too extreme for forest growth. Most observers assumed that the south-facing slopes were drying out too quickly because of the intense insolation (e.g. Weigold 1935: 224), and the general observation was that there was a difference in climate between south-facing and north-facing slopes which had `… the greatest contrasts in insolation, exposure to winds, duration of snow cover, amount of precipitation, rapidity of run-off, etc' (Hanson-Lowe 1940: 366). Ku and Cheo made a similar point in stating that `… this difference in insolation [south slope/north slope] causes a considerable difference in the rate of evaporation and hence, in turn in the nature of vegetation (Ku and Cheo 1941: 127); even before then Rock had similarly attributed the absence of forests on the south-facing slopes `to earlier melting of snow' (Rock 1930: 161). All these observers assumed that a substantial reduction in the availability of water lowered the upper treeline by many hundreds of metres on the sunnier, southern-facing slopes. At around the same time Schäfer (1938: 56 et seq) tried to explain the absence of forests not only by the higher evaporation, but also by the distribution of snow cover. In addition he, and more recently Wissmann (1960: 268), took account of the extreme diurnal changes of temperature and the resultant desiccation of the vegetation. The point is as follows: desiccation occurs when a woody plant starts to transpire in late winter, as a result of the increase in daytime temperatures on sunny slopes; yet at this time the roots are still frozen in the ground and cannot supply water upwards: thus the plant, transpiring without a water supply, desiccates and dies. Wissmann gives the same explanation: the south-facing slopes are free of snow cover throughout nearly the whole dry winter; a high evaporation is linked to high diurnal changes of temperature and causes thawing by day; but only grass cover and not tree or shrub cover can survive when regular nightly frosts bring temperatures as low as minus 15 °C to minus 20 °C . All of these hypotheses recognise relevant aspects of the climatic conditions of the south-facing slopes. If they were completely accurate then any forest growth on the sunny southern slope should be impossible; however, in many locations, there are still small trees or small groves of trees. Since where one tree grows in similar soil conditions a forest can grow (Ellenberg 1988: 392), this testifies to the general possibility of forest growth and suggests that formerly forests existed on these slopes. Further evidence comes from the fact that in some locations a few residual forests are actually found on south-facing slopes. Plate 6.3 is a photograph of a fully south-exposed juniper forest above 3,600 metres at the Yala pass in Zitsa Degu, with Juniperus convallium and J. saltuaria surrounding a small hut and pasture; the main summer pastures are located on the foreground ridge; along the line of the distant background ridge are forest-free south-facing slopes . Other observers also have recorded juniper forests at these altitudes on south-facing slopes. forests (Larix potaninii) and spruce forests (Picea balfouriana, P. purpurea). Often larch and spruce make up mixed stands with juniper. In addition to the climatic factors described above, two other factors must be taken into account to understand fully the widespread absence of forests on the sunny southern slopes at the present time. Chinese geographers have suggested that human activity has not had any significant historical effect on the vegetation (Zheng 1986: 33). However, the present pattern of forest distribution cannot be explained without considering the impact of people and their grazing animals over centuries, if not millennia; it is only recently that research has begun to take full account of such anthropogenic impact in eastern Tibet (Winkler 1994, 1997, Frenzel 1995). It is also necessary to look at the natural occurrence and ecological role of fire. Forest fires are a widespread hazard in the forested regions of the south-eastern Tibetan plateau. Pine forests are especially afflicted (Wang 1961: 54, Yang 1987: 76, Ma et al 1991, Li 1993: 69 and 75, Liu 1994), but fires also affect spruce and fir forests as well. These have a heavy fuel load, and are dry and highly flammable in winter. Moreover, once fires do occur they are very difficult to fight on this steep terrain, and are reported to sweep over enormous areas (Yang 1987: 76, Ku and Cheo 1941: 131). In Zitsa Degu traces of forest fires were abundant everywhere except on moist north-facing slopes. The strongest impact of fire has been on the dryer south-facing slopes and generally below the cloud belt. Wide areas of forest were burned out completely in the late 1950s or early 1960s, leaving behind only a few old trees within young pine stands. In the case of lower Rizegou which is in the cloud forest belt, forest fires have burned from the base to the top of several fir-spruce forests on the south-facing slopes; but the adjoining fir forests on the north-facing slopes inhabited by Giant Pandas were untouched. These are illustrated in Plate 6.4. The north-facing slope is marked . The south-facing slope is mostly forest free except for infrequent small stands , the forest having been destroyed and prevented from regeneration by fire and grazing animals. On the north-east-facing slope to the right a secondary forest has quickly regrown . Higher-up the dead tree trunks surmounting a far right-hand side ridge testify to recent forest fires. One modern report suggests that in west Sichuan 20 per cent of the forest-fires occur by natural ignition from lightning, whereas 40 per cent occur through intentional human action (Yang 1987: 77). The deliberate burning of pasture is a common practice among herders. For example, in Zitsa Degu local Tibetans confirmed that until recently south-facing slopes were burned periodically, so as to clear away unwanted shrubs and trees which reduce forb and grass production (Winkler 1994: 87). The enlargement of agricultural areas by burning is reported from Wo Lung (Schaller 1993: 149), and Tibetan settlers in north Burma kept extensive areas clear of forest by periodic burning (Kingdon-Ward 1947: 73). Reports of pine forest fires in nearby areas of south-east TAR and south-west Sichuan have been analysed for fire prevention purposes (Ma et al 1991; Liu 1994). Findings suggest that with the sole exception of lightning, almost all fires have human-linked causes. In the lower Tsangpo area most pine-forest fires occurred on highly exposed south-facing slopes below 3,300 metres; over 90 per cent of these fires occurred between the months of December and May, while only two per cent occurred during the summer monsoon between July and October. After extended dry periods, and supported by strong winds, fires might climb up into the usually wetter, less fire-prone fir-spruce forest belt above. Further in-depth research needs to be conducted on the impact of natural causes of fire in eastern Tibet; however, existing North American research on fire ecology suggests some likely possibilities, as forest distributions in the central Rocky Mountains of south-west Colorado are similar in some places to those in eastern Tibet. Some of the south-facing slopes were forest free; but these still contained isolated stands of conifers and aspen, a distribution that is a residual effect of fire. Research suggests that before European settlement fires used to occur periodically, over intervals of five to 25 years for ground fires in dry pine forests and intervals of 500 years for the crown fires which give rise to replacement by surviving forest stands, among relatively moist sub-alpine coniferous forests (Wright and Bailey 1982). Usually, the interval between the return of fires is inversely proportional to the intensity of the fire. Crown fires might kill off the whole tree vegetation; but often some tree stands still survive along streams or in other moist locations, and in rocky places: these stands then serve as a seed base for subsequent reclaiming of the former sites by the previous vegetation. Yet, sometimes vast areas are burned completely away, especially if there is a second fire which often leaves no immediate seed source, and so kills off all seedlings. In this case, the former forest area will be replaced temporarily by grasslands, and the forest regrowth might be inhibited for an extended period of several decades, possibly even centuries with recurring grassland fires. Grasslands are a natural, but temporary, stage in the cycle of succession of vegetation; but in the long run the natural rule is that forest vegetation eventually will reclaim its former site. The period here depends upon factors such as topography, exposure, climate, the intensity and frequency of fire, and the availability of seeds. Hence some grassland, especially that on sunny slopes, is likely to be a stage in the natural vegetation cycle of eastern Tibet. However, the long-term perseverance of grassland in most of the south-facing locations, where there has been a widespread absence of forests over many centuries, very likely has a human cause: the intrusion of grazing animals and intentional burning by herders. Taking into consideration that wide parts of Eastern Tibet are cultural landscapes or degraded ecosystems rather than pristine wilderness one needs to reassess the situation in central Tibet. Presently central Tibet is free of forests, except for plantations which have access to ground water. It is difficult to imagine that central Tibet's barren slopes once were forest-clad; yet in the Lhasa area, where the annual rainfall of around 450mm per annum is sufficient to sustain juniper forests, historically forests probably were widespread. Presently only a few relict juniper stands are known to science (see Map 2). For example, one is near Reting (Rwa sGrengs) half a day's drive north-east of Lhasa. The author encountered another on the way to Drigung ('Bri Gung) near Trulda (sPrul mDa'), where there also remain a few birch forests on north-facing slopes. Moreover, a forest can be found even further to the west close to Yamdrok Tso (Yar 'Brog gYu mTsho) in Nagarze (sNa dKar rTse) at 4,450 metres where rainfall is only 370mm per annum. Neither of these stands of juniper are to be found in the standard vegetation map of China (Hou 1979), although it does have a special symbol to designate isolated juniper forests in other areas of the plateau. The question of present potential forest growth in central Tibet was first raised by Reiter (1981: 70). However some authors (Li, B. 1993: 521) regard these forests as remnants of a warmer and moister climate, which prevailed about 7,500 to 3,000 years ago, when forest cover was wider distributed in Tibet (i.e. Wang and Fan 1987). Yet these relict forests are mostly found in sanctuaries near monasteries, which themselves date back not more than 1000 years, as in the case of Reting, which was founded in 1036. Thus the survival of such sacred forests indicates a direct result of human protection. In addition, traces of human activity can be dated back some 5,000 years ago; for example, tools found indicate slash and burn agriculture at Karo (mKhar Ro) in the Mekong valley near Chamdo (Chab mDo); human traces were also found in the grasslands above the present treeline from around that time (Huang 1994). Mostly grassland and shrub is found in south Qinghai today; however, there are occasional patches of juniper forests which, though here they grow on both south and north-facing slopes, are denser on sunny slopes and sparser on shady slopes (Huang 1987: 476). Overall, it seems that a crescent-shaped juniper forest belt used to reach from central Tibet up to the north-east (Qinghai/Amdo). This dry open forest belt dominated the areas and the spruce-fir forest belt of the south-east. In a transitional zone, the juniper forests dominated the south-facing slopes, while the north-facing slopes were covered with fir and fir-spruce forests. The deforestation of the past was not a blind onward destruction of resources, but a logical consequence of developing Eastern Tibet as a grazing land. Though the summer pastures above the treeline were abundant, winter pasture was limited by the prevalence of forests at the lower altitudes. In winter, fodder was and is scarce and still forms the constraint on the size of the herds. While the northern slopes usually keep their snow cover throughout the winter, grazing is then possible on south-facing slopes where the snow melts quickly. In winter when the sun is low, its rays hit the steep south-facing slopes almost at a right-angle, so intensifying their power. In terms of natural climatic conditions, the insolation is enhanced by the high altitude and the plateau's location in the subtropics; in addition, the dryness of the plateau's winter climate and its remoteness from human sources of pollution keep the aerosol content very low, thus providing an ideal condition for a high intensity of insolation. Here, the pastures on the sunny slopes are of the utmost importance for the development of grazing. Full utilisation of the south-facing slopes for winter grazing enables herders to keep their store of winter fodder, which is a time and energy consuming necessity in any environment with harsh winters, to an absolute minimum (see Long 1994: 76). Creating additional winter pastures through burning (Ward 1947: 71), or using such south-facing slopes that temporarily have become naturally deforested, enable a larger herd to survive the winter. In this way use of the summer's relatively abundant fodder can be maximised. Grazing animals bite off shoots, trample seedlings, and destroy the ground cover. Forbs and grasses help reduce evaporation by protecting the soil from direct insolation; in addition mosses can retain a lot of water as well. These animals also compact the top-soil, so inhibiting the infiltration of water, increasing surface run-off, so reducing the overall water availability in the ground. Sending dris, yaks and yak-cow hybrids as well as sheep and goats into forests slowly reduces the ground cover and halts natural regeneration, and forests that are subject to such impact over a long period are not able to regenerate and have to give way to shrubs and grasslands. This form of initial degeneration and final deforestation creates the greatest changes especially in the ecotone, that is along the upper treeline and in the wide transition zone from forests to grasslands, which have a fragile ecological balance. The effect is that the treeline is being pushed down further and further, so extending the subalpine grasslands down the slopes. This process now is being speeded up greatly by the current deforestation in eastern Tibet, where former areas of forest are being replaced by grasslands and brush, particularly after clear felling (Yang 1986: 43). In Tibet, as in most places in the world, processes which used to take millennia or centuries can now occur within decades or even years. Deforestation is a common phenomenon throughout China, and many other forest areas such as in Heilongjiang in the north-east are now being depleted in a similarly tragic way (Smil 1983: 227). After the industrial world made its way onto the Tibetan plateau viaChinese modernisation the forests have been reduced nearly by half. This is mostly through planned commercial timber extraction (Smil 1984: 19), and not through intense local population pressure. Yet in the 1980s the usual explanation given by Chinese scientists was that local people were causing the deforestation through firewood gathering, clearing of forests for grazing and cultivation and taking construction wood, economic practices that reflect the new prosperity (Li and Zhang 1986: 9). Concrete figures and information on the forest economy of the TAR are still unusual and sometimes unclear; but there are many reports on the forest economy of west Sichuan that appear to use statistical records of the official forest bureau, including forest inventories. The most alarming reports in China come from west Sichuan (Smil 1984: 19), where forest destruction has been gathering momentum since the late 1950s (Yang 1987: 74). Within Sichuan, Gardze and Aba Autonomous Tibetan Prefectures (ATP) face the most extreme crises. According to some estimates west Sichuan's forest cover has decreased from 30 per cent in the 1950s to 14 per cent in the 1980s (Li 1993: 95). In Gardze the forest area along the Nya Chu (Chin. Yalong) river valley has been reduced from 29.5 per cent to 14 per cent between the mid-1950s and mid-1980s. In Aba some figures indicate that over a 30-year period forest cover has been reduced from 19.4 per cent to 10 per cent and that 60 per cent of the growing stock has been removed (Yang 1986: 41); another report suggests that 68 per cent of the forest cover has been removed (Smil 1983: 228). For the upper reaches of the Min River of Aba ATP, forest coverage is estimated to have decreased from about 50 per cent in the fourteenth century, to 30 per cent in the late 1940s, further down to 16.1 per cent in the late 1980s (Zheng 1986: 34, Zhao 1992: 59). These often-quoted figures may be misleading as they may be both unclear (above) and atypical. Along the Min River and its tributaries they should not be generalized regionally, as large-scale commercial timber extraction without reforestation was already in full swing at the beginning of this century, organised by contractors from Chengdu (Campbell and Qin 1983: 223; Ku and Cheo 1941: 95). Against this it has to be noted that forest destruction is at its most severe along the major highways and rivers. In the past, timber production depended on rivers to float the logs down to the basin of Sichuan. Such floating is still commonly practised; but a road network has been established, in part to serve the forest industry. Some areas, especially in the south-east of the TAR, so far have been spared from heavy destruction due to their inaccessibility; but the TAR as a provincial-level unit now has begun to be recognised as the richest region for timber in the whole of China (Xinhua 1994). Forestry is the paramount industry in the highlands of western Sichuan, where it plays a key role in promoting the development of transport infrastructure and other industries (Dong 1985: 53). Sales of timber clearly provide a most important source of cash revenue for the administrations. Timber is a key commodity in China as a whole, where there is a large and increasing demand for timber from the lowlands apparently well in excess of the natural growth rate of the forests. Publications in Chinese, western accounts, and direct local observation all indicate that for four decades the annual timber cutting rate has greatly surpassed the natural increment in West Sichuan; for Sichuan taken as a whole, reports accounts suggest a figure of over two to three times higher (Zheng 1985: 34; Smil 1984: 227). In Aba ATP the state timber procurement quota (set by the provincial forestry bureau), even if taken alone as an indication of annual felling, has far exceeded the natural annual increase. The cumulative scale of felling is such that of the total of eleven forest enterprises within the prefecture, eight have exhausted their resources and five have no areas of continuous forest left to secure their income; if one adds up the figures for timber consumption in Aba at prefecture and county level, and puts together with those for free market consumption, annual cut exceeds the natural increment by an factor of four to five (Yang 1986: 41; EPIGPA 1990). Further research on management procedures and accounting procedures would be useful, but the existing published analyses of the economics of forest enterprises in this part in Chinese suggest the following: though pricing does not take account of scarcity of resources forestry provides a very high proportion of county-level cash revenue. According to Zhao (1992: 56) in many counties of the Tibetan Prefectures the timber industry provides around 70% of the cash revenue: however, this figure is clearly on the decline due to resource exhaustion. Further pressure comes from recent economic reform. The forest enterprises are now accountable units whose profitability is assessed directly. Moreover, they have to fund the pensions for former employees which may outnumber active employees (Zhao 1992: 57). For example the Drango (Dra nGo, Chin. Luhuo) Forest Enterprise, one of Gardze ATP's 7 state forest enterprises, is reported to harvest three times the amount of the annual increment just to pay the salary costs for its 2,500 employees (He 1991:26). Zhao indicates further that the prices reimbursed for state procurement timber are below production cost, let alone anywhere near the open market price. Thus the forest enterprises have to increase open market production to balance losses. On a household and individual level, market reform has radically changed the former subsistence economy and people now require a cash income. Working as a logger for a company , or privately collecting and reselling wood, is one of the ways for Tibetans to make some money. Private entrepreneurs load their trucks with timber bought informally along the roads from local people. On being asked their view on their involvement in the destruction of their own local forests, a Tibetan logger is reported to have answered hesitantly … `What shall we do? We have to feed our families' … (Ludwig 1994). Overall, it is clear that the underlying institutional structure is one of the leading causes for recent deforestation in the Tibetan Prefectures of Sichuan. By imposing a state procurement rate, which has not been based on ecologically and economically sustainable principles, the provincial administration chose to overexploit the forest resource. Since the reform period economic pressures and accounting responsibilities appear to have perpetuated highly unsustainable production levels for increased sales on the free market in order to finance pensions and losses from state quota sales. Large-scale clear-felling is practised widely, which can be detrimental to the future of the forests especially when reforestation measures are neglected (See Plates 6.1 and 6.5). Though required under Chinese law (Li and Zhang 1986: 10), reforestation after felling is the exception, and slopes are commonly left to themselves after the virgin forests have been felled. Estimates of the ratio of trees felled to trees planted is as high as 10:1 (He 1991: 26), and of the total reforested area in the south-western mountain region as being only 12.7 per cent of the deforested area (Li 1993: 103). It is uncertain how many of the planted seedlings will actually grow into trees: though in places methods have been used which should guarantee a seedling survival rate of 85 per cent (Yang 1992: 22), overall a survival rate below 30 per cent is common (Li 1993: 103). Plate 6.5 - Eastern Tibet: modern deforestation along the Kangding-Litang highway, in East Nyachuka County (Yajiang Xian) Ganzi TAP, West Sichuan. (per Wissmann 1961: 25). To the northwest of this area forests are presently absent, except rare relict forests. temperature, and once the canopy is largely destroyed, forest regeneration is seriously hindered. Canopy destruction allows the exposure of seedlings to extreme frosts and many will die from frost-lifting (Yang 1986: 42). Chinese research further confirms that if forests are cut or destroyed, and they not afforested by artificially cultivated seedlings in time, then they are often reduced to scrub or meadow (Han 1985: 71), and the recommendation is that such `… clear-cut plots should be dispersed and limited to three to five hectares …' (Yang 1987: 78). Clear-felling and lack of afforestation leads to wider environmental consequences as `knock-on' effects to local erosion. The high insolation on the south-facing slopes makes for an evaporation rate that is four times higher for clear-cut areas than for forests. On a clear-cut surface water run-off is more than twice the volume of forested areas, and the peak flows are at around one and a half hours after precipitation, rather than the 11 hours after rainfall of forested areas. Thus a reduction to the forests' water retaining capacity over the catchment area leads to seasonal extremes of water run-off (Yang 1986:42). In the dry season, run off is reduced seriously. A provincial commission (EPIGPA 1990) concluded that these reductions were responsible for a recent decline in water available for irrigation. In Dujiangyan where the waters of the Zong Chu (Chin. Min Jiang) are divided up to irrigate the wide Chengdu plain, the February water flow has decreased from 161 cubic metres/second in the 1930s to 108 cubic metres/s today, and the Chengdu plain loses 270 million cubic metres of water between January and May, delaying irrigation on 70,000 ha of rice-paddy`, causing average annual losses of 1.3 billion Yuan (EPIGPA 1990). By contrast in the rainy season heavy erosion, debris flows and floods can be the consequence; one analysis suggests that the flood frequency in west Sichuan has risen from once in 15 years to once in five years as a result of widespread forest destruction (Zhao 1992: 58). The forests of the Tibetan plateau fulfil a crucial hydrological function both in and beyond China. One third of the world's population lives along the rivers which originate on the Tibetan plateau; there is also the issue of the relation between deforestation and siltation of damns and hydroelectric installations. The forests of Tibet also have a wider regional and global climatic importance. The Tibetan plateau is a major factor in the global airstream circulation, especially because of the seasonal routing of the northern hemisphere's jetstream, with its influence on the onset of the Indian monsoon (Reiter 1981). A large change in the region's climate following on from wide-scale deforestation could increase surface albedo, which might contribute to instability in global climatic patterns. It has also been proposed that the Tibetan plateau may have a key catalytic role in the onset of ice ages (Kuhle 1988). Certainly, the region has to use its resources, and China needs timber both now and in the future. In general, forestry science and sound ecological management does not seem to have had much influence on economic calculations, which have tended to reflect profit as short-term returns on expenditure rather than long-term utilisation. Unfortunately, sufficient attention is still not paid in planning and practice to the results of research or the proper implementation of such policy. Zhao (1992: 59) has recommended a phasing-out of the `state contract price' system and a move to the free market. Free market prices will need to reflect all the recurrent costs of forest maintenance and reproduction. Overall there needs to be commitment to a realistic and workable forestry master-plan. Consideration might be given to a `Yangtse upper reaches protection fee' to be levied initially on the relatively rich downstream counties and provinces so as to provide a fund to help to re-establish forests, lower the siltation run-off, and help with a secure economic future for all. Clearly, any such transfer would have to be integrated into overall economic planning in the provinces and other administrative units in the region. There is also a wealth of global experience on sustainable high mountain forestry from other parts of the northern hemisphere, where similar spruce-fir-forests predominate. An exchange and transfer of knowledge could benefit the forestry in eastern Tibet. The current forestry work force needs to be trained in successful reforestation techniques and sustainable forest management. There also is a need to mark out and establish further forest reserves in remaining virgin forest areas, to ensure the conservation of the unique genetic diversity of plants and wildlife, which is unmatched in the world outside the tropics. Here foreign aid could be of great help in initiating pilot projects. One can understand why one western researcher went so far as to term the above economic processes `planned destruction' (Smil 1984: 19), a point to a degree recognised within China by the national-level forestry administration: `as a whole, there has not been any attempt to manage the forest', `the administration of forest industry has not conformed to natural and economic principles' (Dong 1985: 55), and there is the alarming prognosis that: `if the unrestrained activities of local and provincial enterprises and greedy individuals continue at this rate, the western Sichuan forest will not last more than 13 years' (He 1991: 26). However, at the same time the local situation can vary, and there are current examples of sound management in west Sichuan. In 1991, on the upper reaches of the Chu dKar (Bai Shui) River in Nan Ping (Nan Phing) county, north of the Kun dGa 'Ri Pass (Gonggang Ling), the author encountered well-managed forests, with relatively small-sized clear cuts and immediate reforestation measures. On a provincial level several investigation groups (i.e. EPIGPA 1990, Zhao 1992) have been commissioned by the administration of Sichuan. The above analysis is to a very large degree based on Chinese scientific studies. Chinese forestry scientists have carried out much valuable field research in west Sichuan over the last 30 years (i.e. Sichuan Senlin 1992, Li 1990, Yang and Zhang 1992). They have several research stations with experimental plots, for example in Miyalu in Aba ATP, and in Nyingchi (Nying Khri) in the TAR, and have the continued capacity for such work in the future. They may possibly be able to do so: as a report prepared by a National Resource Commission as early as 1941, itself stated in closing: `the forests … should be put under scientific management as soon as possible in order to conserve them, utilise them, and develop them properly' (Ku and Cheo 1941: 131). Andersen, P.N. and J.R. Hansen (1994), Brug af satellitbilleder til monitering af skovrydning i det syd-ostlige Tibet, pp 1-20. Geografisk Institut, Kobenhavns Universitet, Vejleder: K. Rasmussen (unpub). Campbell, J.J.N. and Z.S. Qin (1983), `Interaction of Pandas, Bamboos and People', Jour. American Bamboo Society 4.1/2: 1-35. De Wulf, R.R., R.E. Goossens, J. MacKinnon and S.C. Wu (1988), `Remote Sensing for Wildlife Management: Giant Panda Habitat Mapping from Landsat MSS Images', Geocarto International 3.1: 41-9. De Wulf, R.R., R.E. Goossens, F.C. Borry, B.P. De Roover, J.R. MacKinnon and W.S. Cai, (1990): `Monitoring deforestation for nature conservation management purposes in Sichuan and Yunnan provinces, PRC, LANDSAT MSS and SPOT-1 HRV multispectral data', Proc. 9th EARSeL Symposium, Science Research and Development Joint Research Centre - Ispra Site, pp 317-323. Dong, Z.Y (1986), `Present situation of forest administration in SW region of China and its role in river basin management', in Proc. Intern. Workshop `Watershed Management', Chengdu, pp 53-7. Kathmandu: ICIMOD, CAS. Ellenberg, H. (1988): Vegetation Ecology of Central Europe, 4th ed., Cambridge. EPIGPA (1990), `Environmental Deterioration in NW-Sichuan and the Reversal of Damages by Comprehensive Utilisation', by Environmental Protection Investigation Group of the Political Association (CPPCC) of Sichuan. Bull. Soil and Water Conservation 10.1: 20-25 (in Chinese). Fix-Kirst, J. (1994), Zur Problematik der Kahlschlagskartierung in Südosttibet mittels Satellitenfernerkundung, pp 1-38. Kartographie TU-Dresden, Betreuer: M.F. Buchroithner (unpub). Frenzel, B., Li Jian, and Liu Shijian (1995), `On the Upper Quaternary paleoecology of Eastern Tibet - Preliminary results of an expedition to the Eastern Tibetan Plateau, 1992', Science in China (Ser. B) 38.4: 485-94. Han, Y.F. (1985), `Forest Felling and Regeneration in the SW-Mountainous Prefecture of China', in Proc. Intern. Workshop `Watershed Management', Chengdu, pp 67-73. Kathmandu: ICIMOD, CAS. Hanson-Lowe, J. (1940), `A Journey along the Chinese-Tibetan Border', Geographical Journal, 95: 357-67. Hou, H.Y. (1979), Vegetation Map of China (Zhonghua Renmin Gongheguo Zhibeitu). Beijing. Huang, R.F. (1987), `Vegetation in the NE part of Qingzang Plateau', in Reports on the NE part of the Qinghai-Xizang (Tibet) Plateau by the Sino-West German scientific expedition (1981), Hövermann and Wang, eds., pp 438-95. Beijing. Huang, W.W. (1994), `The Prehistoric Human Occupation of the Qinghai-Xizang Plateau', Göttinger Geogr. Abhandlungen 95: 201-19. Ku, C.C. and Y.C. Cheo (1941), `A Preliminary Survey of the Forests in Western China', Sinensia 12: 81-133. Kuhle, M. (1988), `The pleistocene glaciation of Tibet and the onset of ice ages - An autocycle hypothesis', GeoJournal 17.4: 581-95. Leber, D., H. Hausler, F. Holawe and W. Sulzer (1995), `Tibet - Monitoring a Changing Environment on the Roof of the World', in Space and Time in Environmental Information Systems, 9th International Symposium on Computer Science for Environmental Protection, H. Kremers and W. Pillmann, eds., CSEP 95, pp 93-102. Berlin, Umwelt Informatik Aktuell 7, Marburg. Li, B.S. (1993), `The Alpine Timberline of Tibet', in Forestry Development in Cold Climates, J. Alden, J.L. Mastrantonio and S. Odum, eds., pp 511-27. New York. Li, C.B., ed. (1990), Ecological Study of Sichuan Forest (1984-90). Chengdu: Sichuan Publishing House of Science and Technology (in Chinese, pp 585, English abstracts, pp 45). Li, W.H. (1993), Forests of the Himalayan-Hengduan Mountains of China and Strategies for their Sustainable Development. Kathmandu: ICIMOD. Li, W.H., and M.T. Zhang (1985), `Watershed Management in Mountain Region of SW-China' in Proc. Intern. Workshop `Watershed Management', Chengdu, pp 3-23. Kathmandu: ICIMOD, CAS. Liu, D.Y. (1994), `Preliminary investigation of forest fire regularities in south-eastern Xizang', Forest Fire Prevention 3: 25-7 (in Chinese). Long, R.J. (1994), `Milk Performance of Yak Cows under Traditional Feeding and Management on Small Tibetan Farms', Acta Prataculturae Sinica 3.1: 71-6. Ludwig, K. (1994), `Kleine Freiheiten und lebendiger Widerstand - Eindrücke aus der alten tibetischen Provinz Kham', Neue Züricher Zeitung 3/3/94, 3p. Luo, X.G. (1987), `The Relationship between the Distribution of Permafrost and Vegetation in the Anyemaqen Mountain Region', in Reports on the NE part of the Qinghai-Xizang (Tibet) Plateau by the Sino-West German scientific expedition (1981), Hövermann and Wang, eds., pp 365-86. Beijing. Ma, Z.G., J.X. Wang and K.H. Mu (1991), `Forest fires in Sichuan's Pinus yunnanensis - forests and classification into fire danger zones', Resource Development and Conservation 7.4: 266-8 (in Chinese). Reiter, E.R. (1981), `The Tibet Connection', Natural History 7/81: 65-70. Richardson, S.D. (1988), `The Forest Economy of Tibet', Commonwealth Forestry Review 67.3: 253-62. -- (1990), Forests and Forestry in China. Washington, DC. Rock, J.F. (1930), `Seeking the Mountains of Mystery - An Expedition on the China-Tibet Frontier to the Unexplored Amnyi Machen Range', National Geographic Magazine Vol. 57, no. 4, 131-185. -- (1956), `The Amnye Ma-Chen Range and Adjacent Regions', pp 194, 80 plates, Serie Orientale Roma XII, Rome: Istituto Italiano per il Medio Estremo Oriente. Schäfer, E. (1938), Ornithologische Ergebnisse zweier Forschungsreisen nach Tibet, Journal für Ornithologie, Sonderheft, 86. Jg. Berlin. Schaller, G.B. (1993), The Last Panda. Chicago: University of Chicago Press. Sichuan Senlin, Editorial Board of `Forests in Sichuan' (1992). China Forestry Publ. House, pp 1-1535. Smil, V. (1983), `Deforestation in China', Ambio 12.5: 226-31. -- (1984), The Bad Earth - Environmental Degradation in China. London. Wang, F.B. and C.Y. Fan (1987), `Climatic changes in the Qinghai-Xizang (Tibet) Region of China during the Holocene', Quaternary Research 28: 50-60. Wang, C.W. (1961), The Forests of China with a Survey of Grassland and Desert Vegetation. Cambridge, Mass. : Maria Moors Cabot Foundation. Weigold, H. (1935), `Südost-Tibet als Lebensraum', Jahrb. Geogr. Gesel. Hannover. Winkler, D. (1994), Die Waldvegetation in der Ostabdachung des Tibetischen Hochlandes - Dreidimensionale Vegetationszonierung mit Bodenuntersuchungen am Beispiel des Jiuzhai-Tals in NNW-Sichuan, Berliner Geogr. Abh. - Beiheft 2: 1-118. -- (1996): Forests, Forest Economy and Deforestation in the Tibetan Prefectures of W-Sichuan. In: Commonwealth Forestry Rev.75.4: 296-301. -- (1998), Die Waldvegetation in der Ostabdachung des Tibetischen Hochlands dargestellt am Bsp. Jiuzhaigous (Zitsa Degu; NNW-Sichuan) und die historische und gegenwärtige Entwaldung',Erdkunde 51.2: 143-163. -- (1998), `The Forest Vegetation on the Eastern Slope of the Tibetan Plateau - A Case Study from Jiuzhaigou (Zitsa Degu; NNW-Sichuan)', Plant Research and Development 47/48, Tübingen. Wissmann, H.V. (1960/61), `Stufen und Gürtel der Vegetation und des Klimas in Hochasien und seinen Randgebieten. A: Hygrische Raumgliederung und Exposition; B: Thermische Raumgliederung und Frostböden', Erdkunde 14: 249-72; Erdkunde 15: 19-44. Woodrow, D. (1990), Monitoring the Renewable Natural Resources of Tibet Using NOAA AVHRR and Topographic Map Data, pp 1-44. SOAS: University of London, GIS, Master's thesis (unpub). Wright, H.A. and A.W. Bailey (1982), Fire Ecology: United States and Southern Canada. New York. Xinhua (1994), `The `Tibet Autonomous Region' tops all provinces in China and regions in the stands of timber', Xinhua 3/3/94, from News from China 6/10. Yang, Y. (1986), `Importance of Ecological Balance in the Subalpine Forest of Western Sichuan, China', in Ecology of the Development of Tropical and Subtropical Mountain Areas, J.H. Cooley, ed., Intern. Assoc. for Ecology, INTECOL Bull. 13: 41-44. -- (1987), `Alpine Forests in Western Sichuan, China and the Effects of Forest Management' in Human Impacts and Management of Mountain Forests, T. Fujimori and M. Kimura, eds., Proc. of Intern. Workshop in Japan, Sept. 1987, pp 67-79. IUFRO. -- (1992), `Historical Development of Felling and Regeneration of Subalpine Forests in Western Sichuan', in Protection and Management of Mountain Forests, Y. Yang and J.L Zhang, eds., pp 18-23. Chengdu. Yang, Y. and J.L. Zhang, eds. (1992), Protection and Management of Mountain Forests, Proc. 5th Intern. Workshop, Sept. 1990, pp 1-269. Chengdu: IUFRO. Zhao, Ang (1992), `Sichuan zhangqu senlin de diwei, kunjing he zouxiang liangxin xunhuan de sikao (The crisis of the forest industry in the Tibetan area of Sichuan and ways towards positive development)', Jinji Dili (Economic Geography) 12.1: 55-61. Changsha, PRC (in Chinese, translation available at http://www.blasum.net/holger/wri/environ/china/for_sich.html). Zheng, Du (1986), `A comparative study of geo-ecological and environmental problems between the Himalayas and the Hengduan Mountains', in Proc. Intern. Workshop `Watershed Management', Chengdu, pp 25-38. Kathmandu: ICIMOD, CAS.